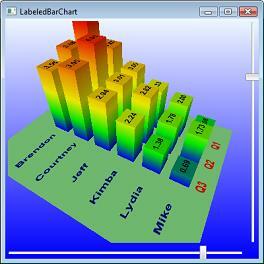 Windows Presentation Foundation (WPF) enables you to build effective and unique graphical user interfaces. 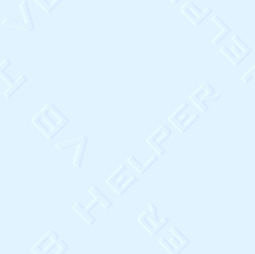 However, it takes a steep learning curve to master the exceptions and shortcuts that are built into WPF. This reference provides you with a solid foundation of fundamental WPF concepts so you can start building attractive, dynamic, and interactive applications quickly and easily. As the book progresses, topics gradually become more advanced, and you'll discover how to use WPF to build applications that run in more environments, on more hardware, using more graphical tools, and providing a more engaging visual experience than is normally possible with Windows Forms. Written by a leading expert on Microsoft graphics programming, this richly illustrated book provides an introduction to WPF development and explains fundamental WPF concepts. Packed with helpful examples, this reference progresses through a range of topics that gradually increase in their complexity. You'll quickly start building applications while you learn how to use both Expression Blend and Visual Studio to build UIs. In addition, the book addresses the needs of programmer who write the code behind the UI and shows you how operations can be performed using both XAML and C#. 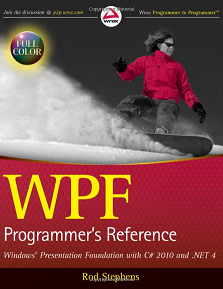 This book is for C# and Visual Basic programmers who want to learn WPF programming. It assumes that you have minimal experience with either C# or Visual Basic but doesn't assume you have any previous experience with WPF. Wrox Programmer's References are designed to give the experienced developer straight facts on a new technology, without hype or unnecessary explanations. They deliver hard information with plenty of practical examples to help you apply new tools to your development projects today.